On Wednesday, November 10th, junior tennis player Okechi Womeodu died suddenly at his high school in Memphis, Tennessee. The sixteen year old was playing an indoor soccer event when he passed out, apparently from a heart condition. 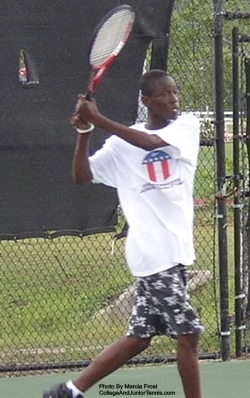 Okechi has been ranked in the top 100 of the USTA National Rankings for the past three years. This summer he was the singles and doubles winner at the Southern Open Championships. Just last week he made it to the finals of the ITF Chanda Rubin Junior Circuit in South Carolina with his doubles partner Jeff Dadamo. Our thoughts go out to the family at this tragic time. He will be greatly missed in the junior tennis community.